Four street kids from Los Angeles discover that America is weirder, and bigger, than they imagined. It’s tempting to call Beverly’s debut a coming-of-age novel; its protagonist, a boy known only as East, is 16. Yet East has come of age long before the action starts: a lookout at a Los Angeles drug house, he is experienced beyond his years. “He was no fun,” Beverly writes, “and they respected him, for though he was young, he had none in him of what they hated most in themselves: their childishness. He had never been a child.” That’s one of the charms and also one of the issues with the novel, which opens with a police shootout at the house East has been paid to protect. In the aftermath, he's sent, with three other young men (one of them his brother), on a looping road trip to Wisconsin, where a troublesome witness must be killed. 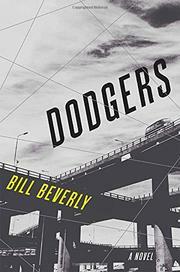 The title refers to the LA Dodgers gear the four put on as camouflage, a strategy to fit in, or at least pass beneath the radar of, an America they do not understand. Beverly is best tracing this elusive strangeness, the way common landscapes—truck stops, gas stations, interstates—can be alien, even dangerous: “Here the ground was nearly empty of buildings and the mountains were like people, huddled figures, blue and gray and white, so high.” Still, as the novel progresses, it begins to lose its path. Partly, it’s that the drama peaks too early, but even more, that East comes to us so fully formed there's no room for him to grow. Yes, he faces challenges and makes decisions. Yes, he adapts to circumstance. Ultimately, however, he does not develop throughout the book so much as remain consistent—the reason, of course, is that he's so highly valued as a lookout, yet it’s problematic when it comes to his arc as a character. An interesting debut that doesn't quite live up to its promise.